Twirl is a weekly two hour radio program which features the finest music from the rock era. You can catch Twirl each Saturday afternoon, from 4:00 to 6:00 p.m., Pacific Time on Sacramento’s Voice, KUBU 96.5 FM, and right here at http://www.twirlradio.com. Twirl is often considered to be the gateway to Saturday night! Check out the Voice’s website at http://www.accesssacramento.org/program_schedules/radio.html. On Twirl, you’ll hear music of a quality rarely heard on Sacramento radio. We’ve been known to foist musical anomalies on an unsuspecting listening public, such as playing the music of Johnny Cash, immediately followed by M.C. Hammer. Another time, we played “Anticipation” by Carly Simon, followed by “Teenage Lobotomy” by the Ramones. Typically, you’ll hear eccentric rock, forgotten classics, lesser-known songs by well-known artists, rootsy Americana music, and some of the finest local bands in the Sacramento area. Twirl is full of surprises. So tune in each Saturday at 4:00 p.m., to experience some of the best musical variety to be found on the airwaves. 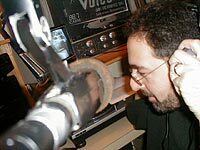 Mike Lidskin started Twirl in January of 1998, thus finally realizing his childhood dream of being involved in radio. On Twirl, he gets the freedom to select and play his own music. He says about Twirl, “My mission is to not just spin rock music, but to educate my listeners about this vital art form.” Indeed, he doesn’t just announce the songs, but gives histories about some of the artists, the albums, and the songs themselves. In 1997, Mike moved back to the Golden State, and he calls Sacramento his new hometown. “All the things that I like about California are right here.” And now, that includes Twirl music.